I'm sure we've all heard, at some point in our lives, the infamous saying 'never judge a book by its cover'. Well, I would like to extend this saying (albeit with a little modification) to the Giraffe Café, in that you should never judge a café solely by its exterior. Walking down Little Lonsdale Street, I had a little difficulty actually locating the restaurant, my only clue was well, the address for one, and also a small sign at the top with the word 'café', accompanied by a symbol of a blue giraffe. From the outside, the place looks like a bitter disappointment. But my impression of the café gradually shifted from dislike to excitement as I walked further into the dining area. This place is hands down one of the quirkiest cafes in Melbourne, with the loveliest interior and decorations. You could tell that some effort and thought had gone into the design of the café, where fusions of color and odd little trinkets and knick-knacks meet to create a warm, cozy atmosphere. The layout is spacious and generously furnished with a hodgepodge of IKEA-like furniture, with shiny hardwood floors and colorful chairs that combine to create the most nostalgic feeling of returning home. Dining in Giraffe Café is definitely a, dare I say it, magical experience. With a tree planted right in the middle of the café, and various ornaments hanging off it, a cardboard moose head on the wall and various giraffe decorations, this place will entertain you to no end. The menu is quite limited, but offers a solid blend of mains and desserts, with items such as burger steaks with mashed potato, shepherds pie, and various quiches. Though I had no qualms about the food, I would say it is rather average. The desserts probably upstage the mains in terms of quality and flavor, with popular ones such as the sticky date pudding and pear and blueberry waffles, which continue to entice customers to keep coming back for more. 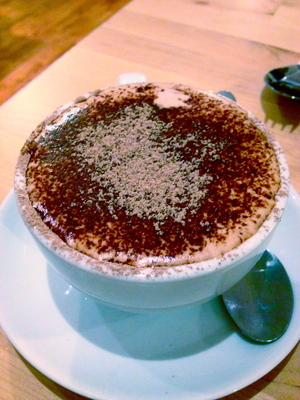 a generous splash of chocolate and froth, yum! Although the food isn't fantastic, the prices are reasonable, and more importantly, the ambience is one-of-a kind. It's hard to find places like the Giraffe Café in the CBD, where you can temporarily escape from the demanding pulls of work and life. I'd definitely return to visit this small cafe with a big heart.